Based on the survival experience of Israeli-Australian Yossi Ghinsberg, Greg McLean’s sixth feature film Jungle is in some respects a departure from the horror in which the Wolf Creek director specialises. But while the genre might differ, there are clear stylistic and thematic affinities with his previous work. Jungle’s motifs of adventurous travel, wilderness, isolation, suffering, endurance and the simultaneous beauty and horror of the landscape are also present in McLean’s Australian-set Wolf Creek opus and monster croc movie Rogue (2007). Jungle begins in 1981, as Ghinsberg (Daniel Radcliffe), a footloose 21-year-old “desperate to escape the well-worn path” and “experience the extraordinary,” travels to Bolivia. After a carefree sojourn in the country’s capital La Paz, Yossi, along with two friends, is enticed away on a makeshift expedition into an uncharted region of Amazon rainforest by an enigmatic Austrian ex-pat, Karl Ruprechter (Thomas Kretschmann). There’s a light-hearted, faintly unreal quality to the prelude in La Paz, where Yossi and his friends, Swiss school teacher Marcus (Joel Jackson) and aspiring American photographer Kevin (Alex Russell), camp with others in a forest of stupendously tall trees, wander the streets to gently twanging Bolivian guitar music and wind up in picturesque bars. The yellow-hued, soft-edged cinematography has a nostalgic Kodachrome quality that underlines the fact we’re viewing events through the idealised lens of Ghinsberg’s memory. At this point the Bolivian landscape, soon to become a formidable player, is still picture-postcard territory: an idyllic playground for the Western traveller. The tonal shift away from this happy-go-lucky introduction is deftly negotiated. Accomplished horror director that he is, McLean cannily teases out the tensions that arise when people are stripped of their usual comforts, individual quirks suddenly thrown into relief. As the four go further off the beaten track, giving the impression of playing at being explorers, a less than appealing aspect of traditional masculinity is brought to the fore, with the sensitive, easily rattled Marcus acting as foil to the aggressively capable Karl, while Yossi and Kevin distance themselves from the former in order to emulate the latter. 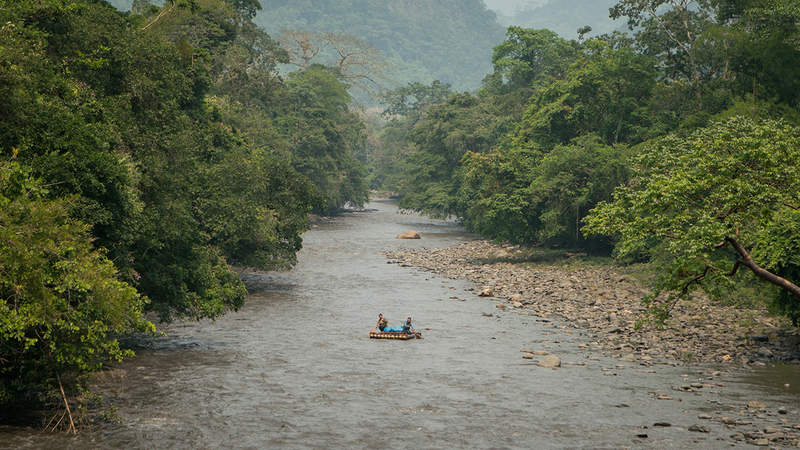 The misguidedness, delusion and extravagant, hallucinogenic madness evoked in Jungle recall the benighted expedition taken down the Amazon River in Werner Hertzog’s Aguirre: The Wrath of God (1972), in which a crazy, messianic Klaus Kinski leads his followers on a futile search for El Dorado (in Jungle, Karl also holds out the lure of gold and an undiscovered tribe to the three younger men). McLean has a talent for intimately portraying humans in extremis, alone in indifferent or hostile environments, dependent solely on fortitude and their wits. In Jungle, the landscape becomes an inexorable antagonist at the point Yossi is swept into river rapids, in a chaotic sequence skilfully (and courageously) shot and edited so as to throw the viewer helplessly into the turmoil both above the churning water and below, dragged under with Yossi, never allowing an opportunity to fix on one position — until all sound is hushed in submerged unconsciousness. An elemental quality also pervades the jungle scenes following Yossi’s escape from the water, as he is drenched by storms, bogged in quicksand and, sanity disintegrating, clutches a tree trunk covered in fire ants and runs burning back to the river. 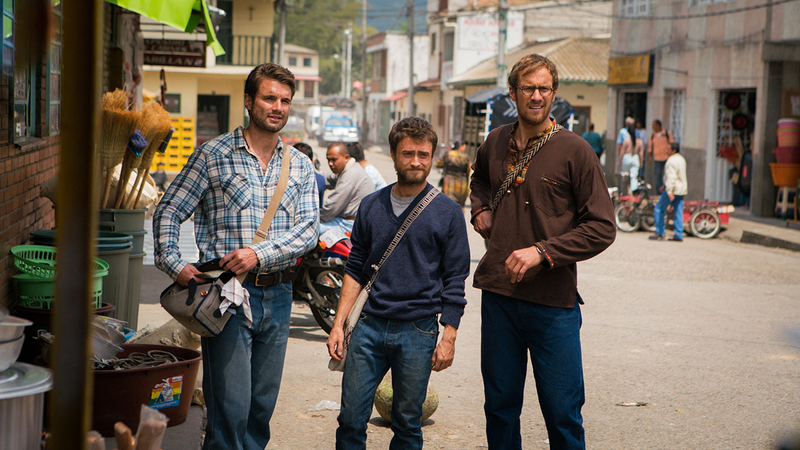 Having visibly lost weight to play the starving Ghinsberg, Radcliffe shoulders the physically demanding performance persuasively, making the transition from an unassuming yet adventurous young backpacker to a filthy emaciated figure running the gauntlet of torturous nature (which McLean not unexpectedly punctuates with strategic moments of body horror) before seemingly attaining a state of spiritual transcendence. 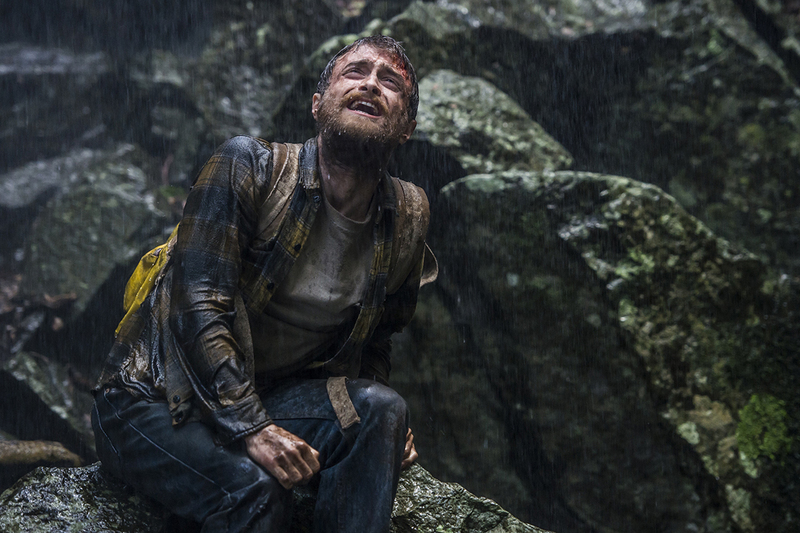 Much of Jungle is a one-man show; Daniel Radcliffe’s intensity easily commands attention for the duration.